Donate Life - Trans-Border's April Charity - Trans-Border Global Freight Systems, Inc.
Each month, the staff and management at Trans-Border choose a local charity to donate to. Trans-Border staff are permitted and encouraged to dress down on Fridays if they donate to our monthly charity. For the month of April, we are supporting Donate Life — a charity near and dear to Trans-Border. Donate Life works to increase the number of donated organs, eyes, and tissues available to save and heal lives through transplantation while developing a culture where donation is embraced as a fundamental human responsibility. Over the past 25 years, Donate Life has registered nearly 145 million organ, eye, and tissue donors in the U.S. – more than 58% of the adult population. Donate Life’s major impact at Trans-Border came in the form of an unidentifiable illness, an organ transplant, and one strong family. In 2015, Jenna Davey, our Air Export Operations Manager, and her family were blindsided when her older brother, Brian, became suddenly and severely ill.
For reasons still unknown and within a few days’ time, Brian’s liver ceased working, filling his body with fluid, and he quickly developed jaundice. Soon after, Brian was having over seven liters of fluid drained from his system every other day. In the harrowing six months that followed, Brian fought for his life against liver and kidney failure, a build-up of ammonia, a week-long sedation on a ventilator, and a slate of other complications and challenges. Several months into Brian’s illness, the Daveys were introduced to Donate Life — an organization that would be helping them locate a suitable donor for their brother and son. Jenna was actually approved to be a living donor — an extremely rare occurrence, even for a sibling — but complications with Brian’s disease inhibited her from donating. Their change in fortunes came like the rest of the illness — very suddenly. On March 11, 2016, Jenna and her family received a call from Brian, who was receiving treatment at Mt. Sinai Hospital. A donor had been found and he was going into surgery immediately. The Daveys hopped on a train and rushed down to Manhattan to await their son’s nine-hour surgery. The transplant was a resounding success. 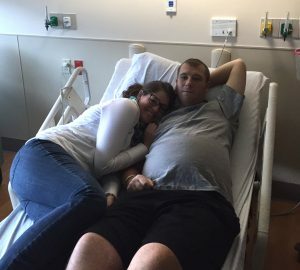 “It’s like a miracle,” Jenna says, “my family had been preparing for the worst.” She goes on to describe that, seemingly instantly after the surgery, Brian’s bright and charismatic demeanor returned, and he was up and walking within hours. Brian celebrated his 3rd Liver Day this year. 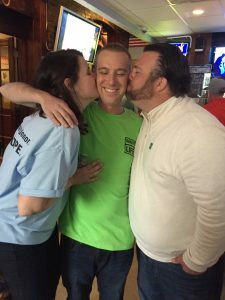 Yes — Jenna, Brian, and their family have created a holiday, aptly titled “Liver Day,” to commemorate Brian’s battle. His daughter turns one this year and he is celebrating four years with his wife, two things him and his family are eternally grateful for. 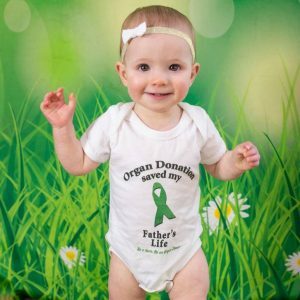 The Daveys battle is far from over — they now advocate fervently for Donate Life and organ donation! From sign-up drives to advocating to her colleagues, Jenna and her family are determined to make sure more families have the opportunities hers did. If you have any questions about Donate Life, please visit Donate Life or reach out to Jenna at jdavey@tbgfs.com.